2000-2005: PhD in Advanced Computer Architecture (PhD Thesis: "Increasing the Performance of Instruction Level Parallelism Processors Through Predictive Methods"), "Politehnica" University of Bucharest, Faculty of Control Systems and Computer Science, Romania, Supervisor: Prof.univ.dr.ing. Mircea Petrescu. Department (Topics: Microprocessors Systems, Simulation and Optimization of Advanced Computer Architectures, Prediction and Speculation in Advanced Architecture, Introduction to Computing Systems). 2001-2005: Teaching assistant for the objects Microprocessors Systems, Simulation and Optimization of Advanced Computer Architectures, Prediction and Speculation in Advanced Architecture, Computer Science Department, The Engineering University, "Lucian Blaga" University, Sibiu. 2008 - 2016: Associate Professor, "Lucian Blaga" University, Sibiu, Engineering Faculty, Chair of Computers, subjects: "Systems with microprocessors", "The Logical Basics of Computers", "The Simulations and Optimizations of Calculations Architectures", "Advanced Arhitectures" (by The Decree of The Education, Research and Youth Executive Department 3669 / 07.04.2008). 2016-present: Professor for the previously mentioned objects + “Embedded Systems”, "Evolutionary Computing"
I published 6 books in Computer Architecture, two in "Lucian Blaga" University Press, Sibiu (1999, 2007), one in The Technical Publishing House, Bucharest (2000) and another three in “MatrixROM” Publishing House Bucharest (2003, 2005, 2007). I published 1 book containing a collection of math exercises for high school graduation examination and for technical higher education in “MatrixROM” Publishing House Bucharest (2016). In addition, I published over 78 scientifically papers in Computer Architecture and Educational Software Tools in some prestigious journals (ISI-INSPEC) and international conferences. I got 9 National Research Grants as a Project member (ANSTI, CNCSI, POSDRU, UEFISCDI) and I am member in H2020 project iREAD ( Infrastructure and integrated tools for personalized learning of reading skill). 31.05.2000 – 11.07.2000: Specialization and preparing Ph.D. in Computer Architecture at University of Hertfordshire, Hatfield United Kingdom. 25.02.2001 – 27.02.2001: I participate with plenary speach from „Lucian Blaga” University of Sibiu, at Technology Day East Europe "Design, CAD, characterization and testing issues in microsystems and subsystems", Budapesta (Ungaria), conference held with support of NEXUS User-Supplier Club "CAD", event organized by European Commission - Information Society Technologies and Microelectronics. 19.03.2006 – 22.04.2006: Visiting researcher for five weeks in 2006 at University of Catalunya, Barcelona, Spain - research carried out under the HPC-EUROPA project (RII3-CT-2003-506079), with the support of the European Community - Research Infrastructure Action under the FP6 "Structuring the European Research Area" program. 02.07.2009 – 03.07.2009: Training session about Methodology on the Development of the National Qualifications Framework for Higher Education, within POSDRU Project nr.2/1.2./S/2 – “DOCIS”, promoted by ACPART National Agency, Cluj-Napoca. March 2010: Session of instruction on the instruments of the National Qualifications Framework for Higher Education, in the POSDRU Project no.2/1.2./S/2 “"The Development of the National Qualifications Framework for Higher Education in Romania “THE DEVELOPMENT OF AN OPERATIONAL SYSTEM OF QUALIFICATIONS OF THE HIGHER EDUCATION SYSTEM IN ROMANIA”, Timisoara. April 19th 2010: Instruction session on the Intel Multicore technologies, having the themes: (1.1) Parallel Programming with OpenMP and Advanced Issues in OpenMP 3.0, (1.2) Using the software instruments: Intel Compiler Suite & Microsoft Visual Studio 2008 and respectively (2.1) Parallelism Tools – Checking for Thread Correctness and Performance, (2.2) Using the software instruments: Intel Parallel Studio & Microsoft Visual Studio 2008. The session was organized by the NCIT-UPB (National Center for Information Technology of ”Polytechnic” University of Bucharest –Ph. D. Lecturer Emil Slusanschi) team in cooperation with Academic and Industry partners and it took place in The Advanced Architectures of Information Processing Research Centre (CCAAPI - http://acaps.ulbsibiu.ro/research.php), Sibiu. April 29th 2010: Representant of the “Lucian Blaga” University from Sibiu in the Validation Association of the qualifications according to the university study field “Computers and the Information Technology”, held within the project “THE DEVELOPMENT OF AN OPERATIONAL SYSTEM OF THE QUALIFICATIONS OF THE HIGHER EDUCATION SYSTEM IN ROMANIA” (DOCIS) and organized by the ACPART Agency, Bucharest. 21.10.2010 - 22.10.2010: I attended as an observer and the coordinator teacher for the "EUN Partnership / EUROPEAN SCHOOLNET: TEACHING INTERNET SAFETY" REF - 2010/TIS/T10/FLOREA (a project developed through a partnership between the European Schoolnet and TeachToday consortium) at the international conference "Safer Internet Forum 2010 (SIF 2010)" held at European Commission headquarters in Luxembourg. The conference was focused on issues of security, online privacy risks, behavior and commitment of young people in cyberspace offered as support for social networking websites and bringing together representatives from industry, law enforcement authorities, child welfare organizations and policy makers. 11 February 2011: I participated with plenary speach, as Short Time Expert in DOCIS project development team (the license program: Multimedia Systems), in the Validation Association of the qualifications according to the university study field "System Engineering", held within the project "THE DEVELOPMENT OF AN OPERATIONAL SYSTEM OF THE QUALIFICATIONS OF THE HIGHER EDUCATION SYSTEM IN ROMANIA" (DOCIS) and organized by the ACPART Agency, Bucharest. 08-10 March 2011: Training School on ENERGY EFFICIENCY IN LARGE SCALE DISTRIBUTED SYSTEMS, research carried out under the COST IC0804 European Program, with the support of IBM Zurich (Switzerland), Ecole Normale Superieure de Lyon (France) and organized by the Department of Electronics and Computer Science, Faculty of Electrical Engineering and Computer Science, "Transilvania" University of Brasov, Poiana Brasov, Romania (see picture). 22-23 February 2012: I followed the course "QUALITY MANAGEMENT IN HIGHER EDUCATION", having as main themes: "Communication for university management", "Knowledge stakeholder requirements and adapt to university services", "Improving the process management of the universities”, "Institutional culture, motivation and leadership", "Accreditation and certification". The course was supported by professors from Academy of Economic Sciences, Bucharest (ASE) and ran through the project "Academic community for quality in higher education", POSDRU/86/1.2/S/61959 contract, being organized by ASE Bucharest and "Alexandru Ioan Cuza" Iasi universities, respectively. 24-27 April 2012: Training School on ALGORITHMIC TECHNIQUES FOR REDUCING ENERGY CONSUMPTION OF COMMERCIAL WEB SEARCH ENGINES and ENERGY CONSERVATION IN WIRELESS SENSOR NETWORKS, research carried out under the COST IC0804 European Program, with the support of Yahoo Research (Spain), University of Cantabria (Spain), University of Pisa (Italy), Copenhagen Business School (Denmark) and Rotterdam School of Management (Netherland) and organized by the Mathematics and Computer Science Department, University of Balearic Islands, Palma de Mallorca, Spain (http://cost804trainingschool.uib.es/wp-content/uploads/2011/12/draft-lecture-summaries1.pdf). 6-11 June 2012: Training School on the themes: (1) NVidia CUDA programming: CUDA, GPU and parallel computing, CUDA memory / execution model and development environment, Techniques to increase parallelism; (2) OpenCL programming, within the 9th edition of the NCIT-UPB Summer School (National Center for Information Technology of ”Politehnica” University of Bucharest - Associate Professor Emil Slusanschi, PhD and Professor Nicolae Țăpuș, PhD). Between of June 6-8th, Professors Dan Negrut, Daniel Melanz and Andrew Seidl from the University Madison Wisconsin, USA hold lectures / practice labs on NVidia CUDA programming, while on June 11th, Dan Petre from Intel Software and Solutions Group, Romania. 1 Martie 2012 – 30 Noiembrie 2012: participare în programul de formare profesională “Şcoală universitară de formare iniţială şi continuă a personalului didactic şi a trainerilor din domeniul specializărilor tehnice şi inginereşti – DidaTec”, proiect POSDRU/87/1.3/S/60891, furnizor Universitatea Tehnică din Cluj-Napoca. 25-28 September 2012: I participated with plenary speach - Ongoing Computer Engineering Research Projects at "Lucian Blaga" University of Sibiu - at Exploratory Workshop: "Science and Technnological Trends for the Next Generation Ubiquitous Computing", within International Conference "Diaspora in Scientific Research and Higher Education", Bucharest, Romania. 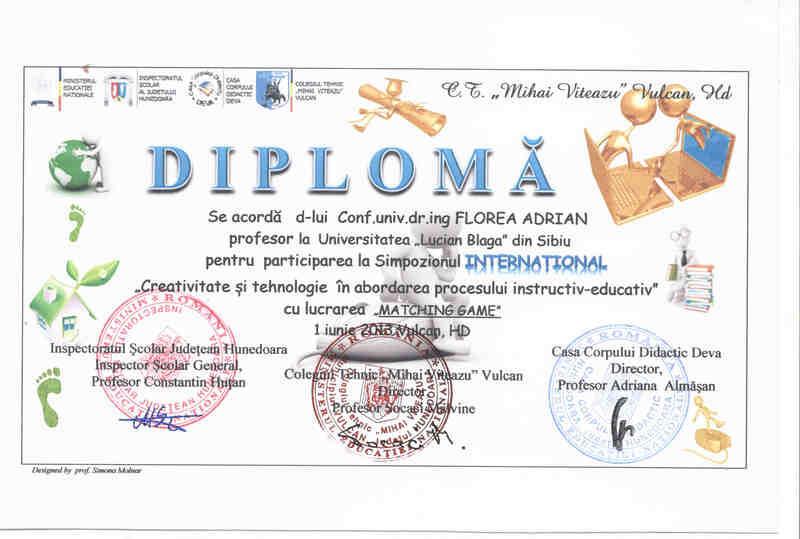 01st of June 2013: I participated with plenary speach - Matching Game - at International Symposium "Creativity and technology in addressing the educational process", Colegiul Tehnic "Mihai Viteazu" ,Vulcan, Hunedoara, România. 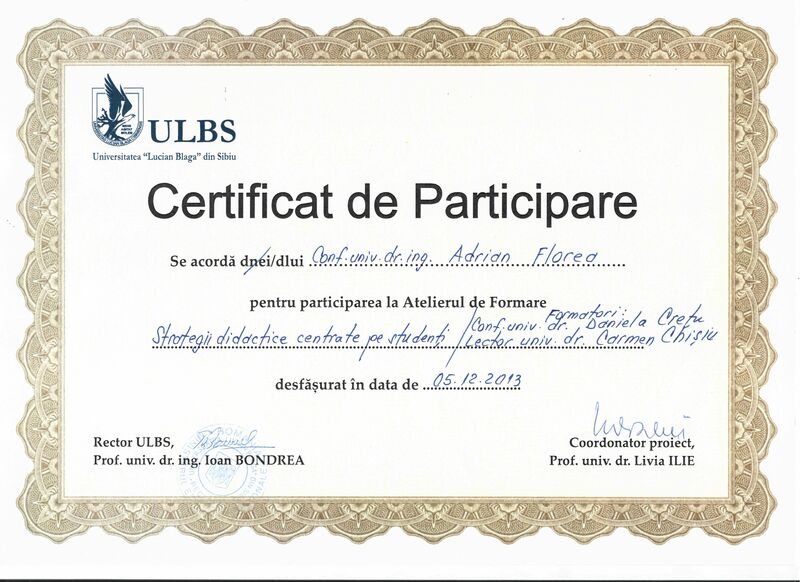 December 2013 and January 2014: I attended training workshops on: Students' assessment and Student-centered teaching strategies, organized by the Department of Consulting, Training and Continuing Education, 'Lucian Blaga'University of Sibiu. 13 - 19 April 2015: Staff Mobility at Buskerud and Vestfold University College Norway, where I have done lectures within computer programming/architecture: Computational Thinking - Everyone should have; Introduction in Computers Science and Engineering -understanding the Hardware – Software Interface, Energy saving in advanced architectures, Different approaches for solving optimization problems using interactive e-learning tools. 07 - 08 September 2015: I participated at workshops specifically for teachers, based on the new “MIPSfpga” core entitled "Teaching Computer Architecture using MIPSfpga and the Xilinx-Digilent Nexys 4 DDR platform", organized by the Imagination University Programme (http://community.imgtec.com/university/ ) with the support of Mobile Graphics London (UK), Xilinx Inc. (http://www.xilinx.com/), Imagination Technologies Ltd, held at Imperial College London, UK ( https://gallery.mailchimp.com/7498613c9baa15d04cae43ba3/files/Flyer_MIPSfpga_Workshops_in_Europe_2015_v2.pdf ). 14 - 20 May 2017: Staff Mobility at Karlstad University Sweden, where I have done lectures within computer architecture: Computational Thinking - Everyone should have; Introduction in Computers Science and Engineering -understanding the Hardware – Software Interface, Teaching Computer Organization & Design using interactive and visual microarchitectural simulators, Research/ Scientific Methods in Computer Science, Some connections between mathematics and informatics with engineering domain. 24-26 August 2016: I participated sustaining the paper "E-learning Approach of the Graph Coloring Problem Applied to Register Allocation in Embedded Systems", at The Sixth International Conference on Innovative Computing Technology, (INTECH 2016), Dublin, Ireland. 24-29 June 2017: I participated sustaining a paper and as member of the panel "Mobile Services in Smart Cities" at The Sixth International Conference on Smart Cities, Systems, Devices and Technologies, (SMART 2017), Venice, Italy. 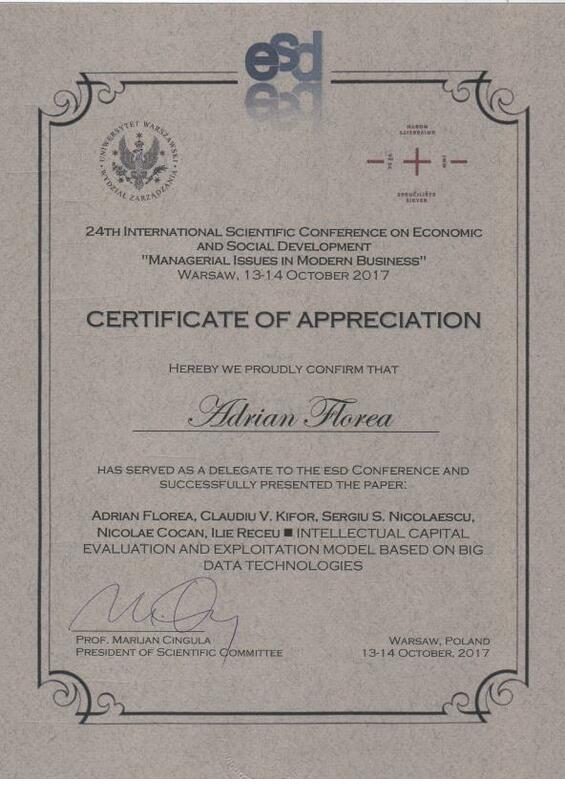 13-14 October 2017: I participated sustaining the paper "Intellectual capital evaluation and exploitation model based on big data technologies" at The 24th International Conference on Economic and Social Development – „Managerial Issues in Modern Business”, (ESD 2017), Warsaw, Poland. 02 – 09 June 2018: Staff Mobility at CESI EXIA University Lyon, where I have done lectures within computer architecture: Optimization of control structures in Programming Languages focusing on compiler optimization techniques and software development tools targeting embedded architectures and Genetic Algorithms and Parallel Architectures emphasizing the CPUs optimization from performance, energy and thermal dissipation perspectives using evolutionary algorithms. 24-26 September 2018: I participated sustaining the paper "Smart parking system - another way of sharing economy provided by private institution", at The 13th International Conference on Digital Information Management, (ICDIM 2018), Berlin, Germany. 29-31 Octomber 2018: I participated with the paper "Optimal Partitioning of LLC in CAT-enabled CPUs to Prevent Side-Channel Attacks", at The 10th International Symposium on Cyberspace Safety and Security, (CSS 2018), Amalfi, Italy. 2010 – present: Member of the Mathematics Science Society from Romania (SSMR – Sibiu, Card no. 91 / 06.02.2010). 2012 - present: Affiliate member of European Network of Excellence on High Performance and Embedded Architecture and Compilation (HiPEAC), Affiliation - University of Sibiu, Advisor - Professor Lucian Vintan. 2013 - present: Professional member of Association for Computing Machinery (ACM - Card no. 3587735). Arpad Gellert, Lucian Vintan, Adrian Florea, A Systematic Approach to Predict Unbiased Branches, "Lucian Blaga" University Press, Sibiu, 2007, ISBN 978-973-739-516-0 (111 pg.). 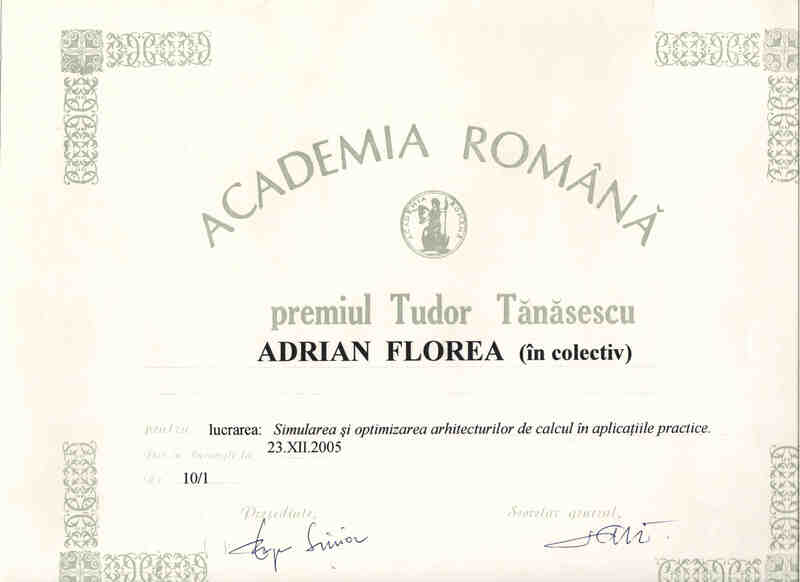 Adrian Florea, Introduction in computers science and engineering. The Hardware-Software Interface, MatrixROM Publishing House, 2007, ISBN 978-973-755-264-8, (313 pg.). Adrian Florea, The dynamic values prediction in the next generation microprocessors, MatrixROM Publishing House, Bucuresti, 2005, ISBN 973-685-980-0, (413 pg. + CD atasat). Adrian Florea, Lucian Vintan, Microarchitectures simulation and optimization, MatrixROM Publishing House, Bucuresti, 2003, ISBN 973-685-605-4 (443 pg. + CD atasat). Lucian Vintan, Adrian Florea, Advanced Microarchitectures, Tehnical Publishing House, Bucuresti, 2000 (PDF-file, 2,746K), ISBN 973-31-1551-7, (312 pg.). Lucian Vintan, Adrian Florea, Microprocessing Systems. Applications., "Lucian Blaga" University of Sibiu Press, 1999 (ZIP-file, 1,111K), ISBN 973-9410-46-4, (245 pg.).. Improving Training Methods for Industry Workers though AI Assisted Multi-Stage Virtual Reality Simulations, The 15th International Scientific Conference eLearning and Software for Education, Bucharest, April 11-12, 2019, DOI: 10.12753/2066-026X-19-007. An Interdisciplinary Review of Smart Vehicular Traffic and Its Applications and Challenges. Journal of Sensor and Actuator Networks. 2019; 8(1):13. A study on forecasting electricity production and consumption in smart cities and factories, International Journal of Information Management, 2019, ISSN 0268-4012, https://doi.org/10.1016/j.ijinfomgt.2019.01.006. Optimal partitioning of LLC in CAT-enabled CPUs to prevent side-channel attacks, 10th International Symposium on Cyberspace Safety and Security (CSS2018) – October 29-31, 2018 – Amalfi – Italy. Smart parking system - another way of sharing economy provided by private institutions, Thirteenth International Conference on Digital Information Management (ICDIM 2018), Berlin, Germany, 24-26 September, 2018. Urban smart mobility in the scientific literature - bibliometric analysis, Engineering Management in Production and Services, Volume 10, Issue 2, 2018, ISSN 2543-6597, Ed. Bialystok University of Technology, Faculty of Engineering Management, International Society for Manufacturing, Service and Management Engineering, Poland, DOI: 10.2478/emj-2018-0010. Performance and Energy Optimisation in CPUs through Fuzzy Knowledge Representation, Information Sciences, Elsevier, Available online 12 March 2018, ISSN 0020-0255, https://doi.org/10.1016/j.ins.2018.03.029, https://www.sciencedirect.com/science/article/pii/S0020025518302068. Multi-objective Optimization for an Enhanced Multi-core Sniper Simulator, Proceedings of the Romanian Academy - Series A: Mathematics, Physics, Technical Sciences, Information Science 19(1):85-93 , Bucharest, 2018. Developing Mobile Apps to Protect Environment, Journal of E - Technology, (DLINE journal), Volume 9, Number 1, February 2018, pp. 1-10. Collaborative Platform for Transferring Knowledge from University to Industry - A Bridge Grant Case Study, Proceedings of the 4th IETEC Conference, Hanoi, Vietnam, December 2017, pp. 475-488. Intellectual Capital Evaluation and Exploitation Model Based on Big Data Technologies, The 24th International Scientific Conference on Economic and Social Development - "Managerial Issues in Modern Business", Warsaw, October 2017. Developing Heuristics for the Graph Coloring Problem Applied to Register Allocation in Embedded Systems, Journal of Multimedia Processing and Technologies (DLINE journal), Volume 8, Number 3, September 2017, pp. 74-86. Low Cost Mobile Embedded System for Air Quality Monitoring: Air quality real-time monitoring in order to preserve citizens’ health, The Sixth International Conference on Smart Cities, Systems, Devices and Technologies, (SMART 2017), June 24 - 29, 2017, Venice, Italy (indexată ThinkMind Digital Library). Improving programming skills of mechanical engineering students by teaching in C# multi-objective optimizations methods, The 8th International Conference on Manufacturing Science and Education, Trends in New Industrial Revolution, June 7-9, 2017, Sibiu, Romania. Teaching the Microprocessors Systems Focused on Societal Challenges: Designing of Performant Cache Replacement Algorithms as Green IT Solution, Journal of Digital Information Management (the peer reviewed international journal in digital information science and technology, ISSN 0972-7272), Publisher - Digital Information Research Foundation Chennai, India, Volume 15, Issue 2, April 2017, pp. 50-65, see http://www.dirf.org/jdim/v15i2.asp. Smart Cities: Challenges and a Sensor-based Solution A research design for sensor-based smart city projects, International Journal on Advances in Intelligent Systems, http://www.iariajournals.org/intelligent_systems/, ISSN 1942-2679), Publisher - International Academy, Research and Industry Association (IARIA), Volume 9, Issue 3 & 4, pp. 579-588, 30 December 2016. Applying the Multi-objective Optimization Techniques in the Design of Suspension Systems, Journal of Digital Information Management (the peer reviewed international journal in digital information science and technology, ISSN 0972-7272), Publisher - Digital Information Research Foundation Chennai, India, Volume 14, Issue 6, pp. 351-367, December 2016. E-learning Approach of the Graph Coloring Problem Applied to Register Allocation in Embedded Systems, The Sixth International Conference on Innovative Computing Technology (INTECH 2016), pp. 88-93, ISBN 978-1-5090-2000-3, Dublin, Ireland, 24-26 August 2016. Sensors and the Smart City: Creating a Research Design for Sensor-based Smart City Projects, The Fifth International Conference on Smart Cities, Systems, Devices and Technologies (SMART 2016), pp. 31-36, ISBN: 978-1-61208-4763, Valencia, Spain, 22-25 May 2016. Teaching Programming by Developing Games in Alice, The 12th eLearning and Software for Education Conference - eLSE 2016 - organized by the Romanian Advanced Distributed Learning Association, Volume 1, pp. 503-510, ISSN: 2066 – 026X; DOI 10.12753/2066-026X-16-073, April 2016. Load forecast on intelligent buildings based on temporary occupancy monitoring, Energy and Buildings 2016, Volume 116, 15 March 2016, Pages 512–521, Elsevier, Received date: 4-5-2015, Revised date: 20-1-2016, Accepted date: 21-1-2016, Available online 22 January 2016, DOI 10.1016/j.enbuild.2016.01.028, http://www.sciencedirect.com/science/article/pii/S0378778816300287. Future House Automation, Proceedings of the 19th International Conference on System Theory, Control and Computing, 14-16th October 2015, Cheile Gradistei, Romania. Different Methods of Artificial Intelligence Used for Optimization the Turning Process, Applied Mechanics and Materials Vols. 808 (2015) pp 60-65, © (2015) Trans Tech Publications, Switzerland, 10.4028/www.scientific.net/AMM.808.60, Submitted: 2015-06-15, Revised: 2015-07-31, Accepted: 2015-07-31. Web Prefetching through Efficient Prediction by Partial Matching, World Wide Web Journal, Internet and Web Information Systems, submitted - 15-Dec-2014, revised - 10-Jul-2015, accepted - 28-Jul-2015, online - 9-Aug-2015, (http://link.springer.com/article/10.1007%2Fs11280-015-0367-8#/page-1). MiniGL: Game and Learning, The 11th eLearning and Software for Education Conference - eLSE 2015 - organized by the Romanian Advanced Distributed Learning Association, Volume 1, pp. 1-8, ISSN: 2066 – 026X; DOI 10.12753/2066-026X-15-027, April 2015. Implementing some Evolutionary Computing Methods for Determining the Optimal Parameters in the Turning Process, Applied Mechanics and Materials Vols. 809-810 (2015) pp 902-907, © (2015) Trans Tech Publications, Switzerland, doi:10.4028/www.scientific.net/AMM.809-810.902, Submitted: 2015-02-16, Revised: 2015-03-30, Accepted: 2015-04-18. Enhancing the Sniper Simulator with Thermal Measurement, Proceedings of the 18th International Conference on System Theory, Control and Computing, Sinaia, 17-19th October 2014. Web page prediction enhanced with confidence mechanism, Journal of Web Engineering, Vol. 13, No.5&6 (2014) 507-524, Rinton Press. Mathematical model and software simulation of suspension's system from OPEL cars, ANNALS OF THE ORADEA UNIVERSITY. Fascicle of Management and Technological Engineering, Vol. 23, No. 3 (December 2014), pp. 1-6, ISSN 1583 – 0691. Software Application for Assessment the Reliability of Suspension System at OPEL Cars and of Road Profiles, ANNALS OF THE ORADEA UNIVERSITY. Fascicle of Management and Technological Engineering, Vol. 23, No. 1 (May 2014), pp. 289-294, ISSN 1583 – 0691. Different approaches for solving optimization problems using interactive e-learning tools, The 10th eLearning and Software for Education Conference - eLSE 2014 - organized by the Romanian Advanced Distributed Learning Association, pp.74-75(1-9), ISSN: 2066 – 026X; DOI 10.12753/2066-026X-14-081. Investigating a New Design Pattern for Efficient Implementation of Prediction Algorithms, Journal of Digital Information Management (the peer reviewed international journal in digital information science and technology, ISSN 0972-7272), Publisher - Digital Information Research Foundation Chennai, India, Volume 11, Issue 5, pp. 366-377, October 2013, see http://www.dirf.org/jdim/v11i5.asp. Using FOCAP Tool for Teaching Microarchitecture Simulation and Optimization, Proceedings of the 17th International Conference on System Theory, Control and Computing, Sinaia, 11-13th October 2013, ISBN 978-1-4799-2228-4, pp. 225-230. Implementing a relational database to survey cars' reliability exploited in Romania, ANNALS OF THE ORADEA UNIVERSITY. Fascicle of Management and Technological Engineering, Vol. 22, No. 1 (May 2013), pp. 313-316, ISSN 1583 – 0691. Software application for OPEL cars'maintenance management (plenary paper), ANNALS OF THE ORADEA UNIVERSITY. Fascicle of Management and Technological Engineering, Vol. 22, No. 1 (May 2013), pp. 317-322, ISSN 1583 – 0691. Matching Game, Proceedings of the International Symposium "Creativity and technology in addressing the educational process", Hunedoara, România, June, 2013, ISBN 978-973-0-11754-7. Developing Online Collaborative Games for e-Learning Environments, The 2nd International Symposium on Knowledge Management and E-Learning (KMEL 2012) in conjunction with The 11th International Conference on Web-based Learning (ICWL 2012), pp. 81-90, 2-4 September 2012, Sinaia, Romania (re-published as post-proceedings volume in Springer Lecture Notes in Computer Science (LNCS 7697) - New Horizons in Web Based Learning). Multi-Objective Optimizations for a Superscalar Architecture with Selective Value Prediction, IET Computers & Digital Techniques, Vol. 6, No. 4 (July), pp. 205-213, ISSN: 1751-8601 (manuscript ID: CDT-2011-0116.R1), submitted - 08-Aug-2011, revised - 19-Jan-2012, accepted - 21-Mar-2012, Stevenage, UK. A Visual Simulation Framework for Simultaneous Multithreading Architectures, Proceedings of the 25th European Conference on Modeling and Simulation (ECMS 2011), Krakow, Poland, June 7-10, 2011 (http://www.scs-europe.net/conf/ecms2011/accepted_papers.html - paper IS-18). Web-based Technologies for Online e-Learning Environments, Proceedings of the 7th International Scientific Conference eLSE – eLearning and Software for Education (eLSE 2011), April 28-29, 2011, Bucharest, Romania, ISSN: 2066-026X, Volume II, pp. 502-509. Enhanced Learning and Educational Management through Online Collaborative Technologies, Journal of Digital Information Management (the peer reviewed international journal in digital information science and technology, ISSN 0972-7272), Publisher - Digital Information Research Foundation Chennai, India, Volume 9, Issue 1, pp. 33-42, February 2011, see http://www.dirf.org/jdim/v9i1.asp. Energy-Performance Design Space Exploration in SMT Architectures Exploiting Selective Load Value Predictions, Design, Automation & Test in Europe International Conference (DATE 2010), March 8-12, 2010, ISBN: 978-3-9810801-6-2, pp. 271-274, Dresden, Germany (http://www.date-conference.com/front, DATE 2010 takes off with a new record - Highest number of submissions ever for DATE, 326 accepted papers from over 980 submitted papers). Online Collaborative Education Management Tool, Proceedings of the 5th International Conference on Virtual Learning (2010 - Towards a Learning and Knowledge Society - 2030), October 29-31, 2010, Targu Mures, Romania, ISSN 1844 - 893, pp. 367-374. Improving course interaction and management with Testing Assistant, Proceedings of the 6th International Scientific Conference eLSE - eLearning and Software for Education (eLSE 2010): Advanced Distributed Learning in education and training transformation, April 15-16, 2010, Bucharest, Romania, ISSN: 2066-026X, pp. 161-174. Testing Assistant - An Interactive Training Tool for Evaluating Students Knowledge, International Conference on Embedding Innovation in Teaching and Management of Higher Education (ICITM 2009), organized by Universiti Teknologi MARA (UiTM) Terengganu, Shah Alam, Selangor, Malaysia, December, 2009, PST Enterprise SDN BHD Publishing Hall, ISBN 978-983-41527-1-0, pp.87 (1-13). Exploring some multicore research opportunities. A first attempt, Fifth International Summer School on Advanced Computer Architecture and Compilation for Embedded Systems (ACACES), Terrassa (Barcelona), Spain, Academic Press, Ghent, Belgium, pp. 151-154, ISBN 90 382 0981 9, July 2009. The Impact of Java Applications at Microarchitectural Level from Branch Prediction Perspective, International Journal of Computers, Communications & Control, Vol. IV, No. 1, pp.27-40, ISSN 1841-9836, E-ISSN 1841-9844, 2009. 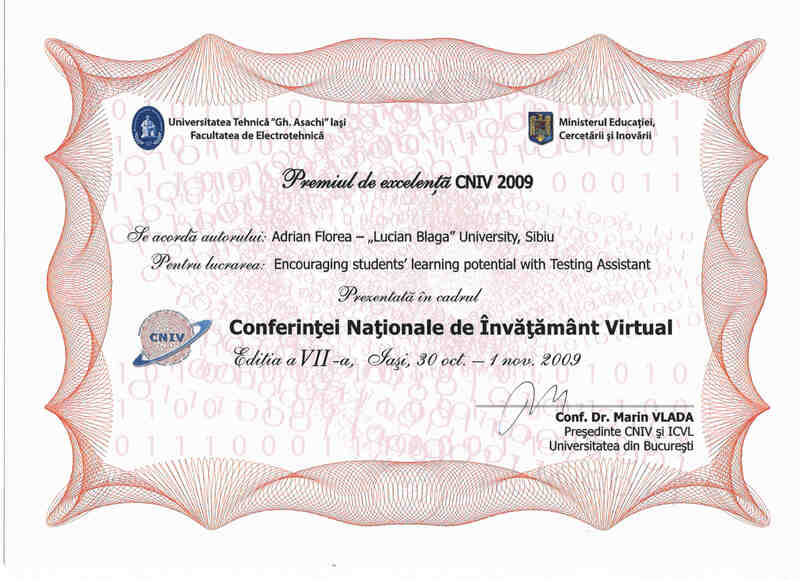 Encouraging student’s learning potential with Testing Assistant, The 7th National Conference for Virtual Learning - Virtual Reality, News Technologies in Education and Research, Models & Methodologies, Technologies, Software Solutions, pp.136-143, ISSN 1842-4708, Iasi, 2009. Exploiting Selective Instruction Reuse and Value Prediction in a Superscalar Architecture, Elsevier Journal of Systems Architecture, Volume 55, Issue 3, pp. 188-195, 2009, ISSN 1383-7621 (submitted 24th of April, revised 31st of July, accepted for publication 17th of November 2008) (acreditata ISI Thomson Journals). Random Degrees of Unbiased Branches, Proceedings of The Romanian Academy, Series A, Volume 9, Number 3, pp. 259-268, ISSN 1454-9069 (acreditata ISI Thomson Journals), Bucharest, 2008. Forcing some architectural ceilings of the actual processor paradigm (invited paper), Romanian Engineering: Past, Present and Future, Mediamira Press, ISBN 978-973-713-223-9, The 3rd National Conference of Romanian Academy of Technical Sciences, Cluj Napoca, 2008. Designing an Advanced Simulator for Unbiased Branches Prediction, Proceedings of 9th International Symposium on Automatic Control and Computer Science, ISSN 1843-665X, Iasi, Noiembrie, 2007 (see a picture during the author lecture). Understanding and Predicting Unbiased Branches in General-Purpose Applications, Buletinul Institutului Politehnic Iasi, Tome LIII (LVII), fasc. 1-4, Section IV, Automation Control and Computer Science Section, Zentralblatt MATH indexed, pp. 97-112, ISSN 1220-2169, "Gh. Asachi" Technical University Iasi, 2007. An Interactive Graphical Trace-Driven Simulator for Teaching Branch Prediction in Computer Architecture, The 6th EUROSIM Congress on Modelling and Simulation, (EUROSIM 2007), ISBN 978-3-901608-32-2, September 9-13, Ljubljana, Slovenia 2007, (special session: Education in Simulation / Simulation in Education I). Unbiased Branches: An Open Problem, Proceedings of the Twelfth Asia-Pacific Computer Systems Architecture Conference (ACSAC 2007), Korea, Seoul, August 2007. Understanding Prediction Limits through Unbiased Branches, “Lecture Notes in Computer Science”, vol. 4186-0480, pp. 483-489, Springer-Verlag, ISSN 0302-9743, (acreditata ISI Thomson Journals), Berlin Heidelberg, 2006. Analyzing Branch Prediction Contexts Influence, Proceedings of Advanced Computer Architecture and Compilation for Embedded Systems, (ACACES 2006), ISBN 90 382 0981 9, L'Aquila, Italy, 2006. Memory Wall - A Critical Factor in Current High-Performance Microprocessors, Science and Supercomputing in Europe, ISBN 978-88-86037-19-8, Barcelona, Spain, 2006. Finding and Solving Difficult Predictable Branches, Science and Supercomputing in Europe, ISBN 978-88-86037-19-8, Barcelona, Spain, 2006. Value Prediction Focalized on CPU Registers, Proceedings of Advanced Computer Architecture and Compilation for Embedded Systems, (ACACES 2005), Academic Press, Ghent, Belgium ISBN 90-382-0802-2, 2005. Understanding Value Prediction through Complex Simulations - Transactions on Automatic Control and Comp. Sc., Tom 47(61), No.2, Timisoara, 2002 (PDF-file, 85K). Simulating an Advanced Superscalar Architecture - 2nd International Conference "Extra Skills for Young Engineers", ESYE 2001, October 17-19, Maribor, Slovenia, 2001 (PDF-file, 131K). Cross-Fertilisation Between Computer Architecture and other Computer Science Fields - 13th International Conference on Control Systems and Computer Science, CSCS 13, May 31-June 2, Bucharest, 2001 (PDF-file, 40,4K). Pre-Computed Branch "Prediction" - Acta Universitatis Cibiniensis, Technical Series: Computer Science and Automatic Control, vol. XLIII, ISSN 1221-4949, Sibiu, 2001 (PDF-file, 398K). Static And Dynamic Branch Prediction Using Neural Networks - Acta Universitatis Cibiniensis, Technical Series: Computer Science and Automatic Control, vol. XLIII, ISSN 1221-4949, Sibiu, 2001 (PDF-file, 106K). Reducing The Technological Gap Between An Advanced Processor And The Memory Hierarchy System - CONTI'2000: Fourth International Conference on Technical Informatics, Timisoara, October 12-13, 2000 (PDF-file, 154K). Branch Prediction: A Criticism and A Novel Scheme - SINTES 10, May 25-26, Craiova, 2000 (PDF-file, 128K). A New Branch Prediction Approach Using Neural Networks- SINTES 10, May 25-26, Craiova, 2000 (PDF-file, 123K). Simulating Some Advanced Processing Techniques into a Superscalar Architecture - Beyond 2000: Engineering Research Strategies, November 25-27, Sibiu, 1999 (PDF-file, 48K). Investigating New Branch Prediction Through Quantitative Approach - Beyond 2000: Engineering Research Strategies, November 25-27, Sibiu, 1999 (PDF-file, 47K). Advanced Techniques For Improving Processor Performance In A Superscalar Architecture - 12th International Conference on Control Systems and Computer Science, CSCS 12, May 26-29, Bucharest, 1999 (PDF-file, 143K). Simulation and Optimization of Advanced Computer - Fourth Year Computer Science (PDF - 146 KB) and First year Msc AAIE (PDF). Microprocessors Systems - Master ICAI Second Year (PDF - 183 KB). Data structures and algorithms - First Year Computer Science (PDF - 365 KB). 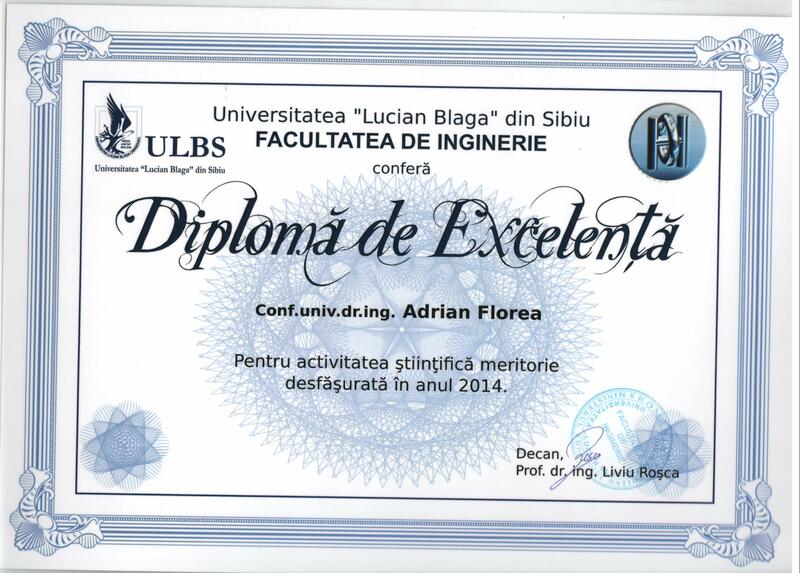 "AD AUGUSTA PER ANGUSTA" Award for young researcher (Through trial to triumph), (see diploma) received from "Lucian Blaga" University of Sibiu in June 2007, for special results obtained in scientifical research. The "SIVECO Popularity" Award (see diploma) representing an Portable Hard Disk USB and The "Excellency CNIV 2009” Award (see diploma) for recognizing the novel ideas in research and development, both received at "EDUCATIONAL SOFTWARE" Contest during the 7th National Conference for Virtual Learning - Virtual Reality, News Technologies in Education and Research, Models & Methodologies, Technologies, Software Solutions (CNIV – 2009): 30 oct.-1 nov. 2009, Iasi, Romania. 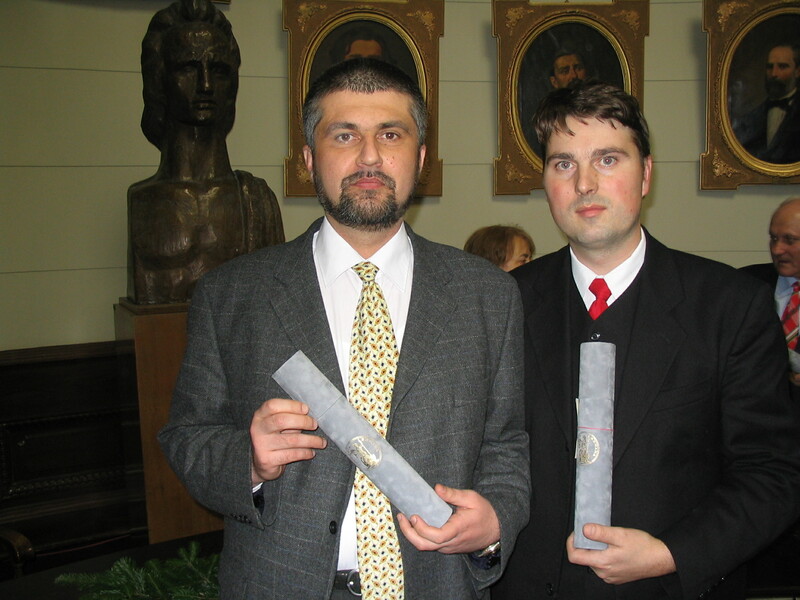 The Prize was awarded in 24th november 2009, at Bucharest University , Chemistry Faculty. 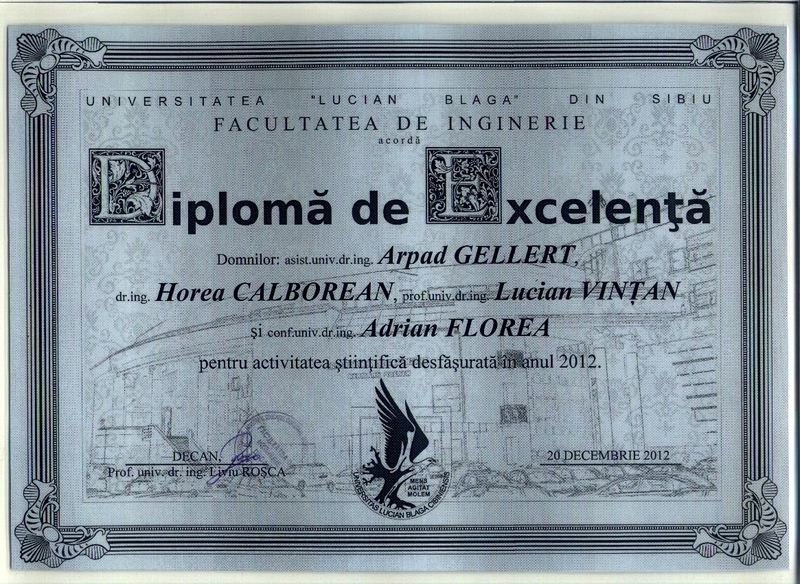 Diploma of Excellence for meritorious scientific research activity in 2012 and 2014, awarded by the Faculty of Engineering, University "Lucian Blaga" of Sibiu. 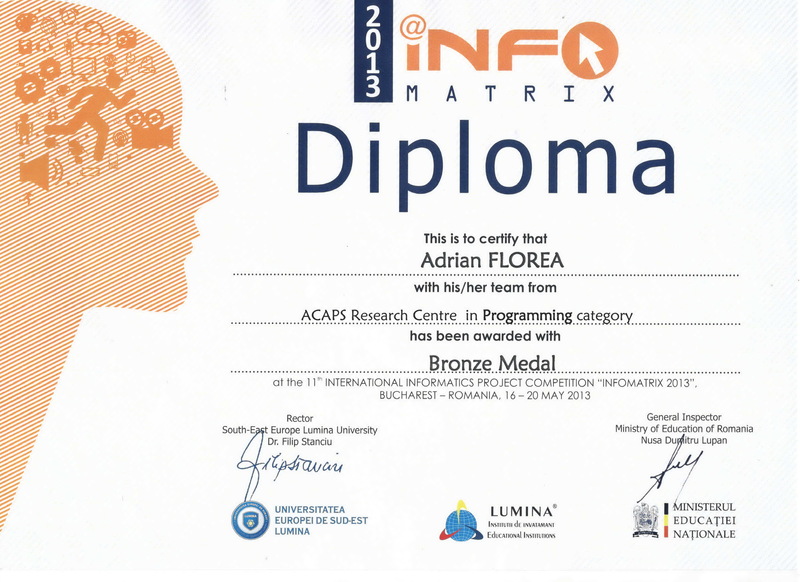 BRONZE MEDAL (as coordinator of the ACAPS Research Centre (ULBS) team) got at the Programming section of the 11th International Informatics Project Competition “INFOMATRIX 2013”, 16-20 of May 2013, Bucharest, Romania, organized by the Ministry of Education of Romania, the Group of Education Institutions “Lumina” and The School Inspectorate of Bucharest. In the international final phase participated 182 projects, the contest getting together teams from 45 countries on 5 continents - Asia, Africa, America, Australia and Europe, being structured on 5 sections: Robotics (70), Programming (28), Short movie (28), Hardware Control (42), Computer Art (24). 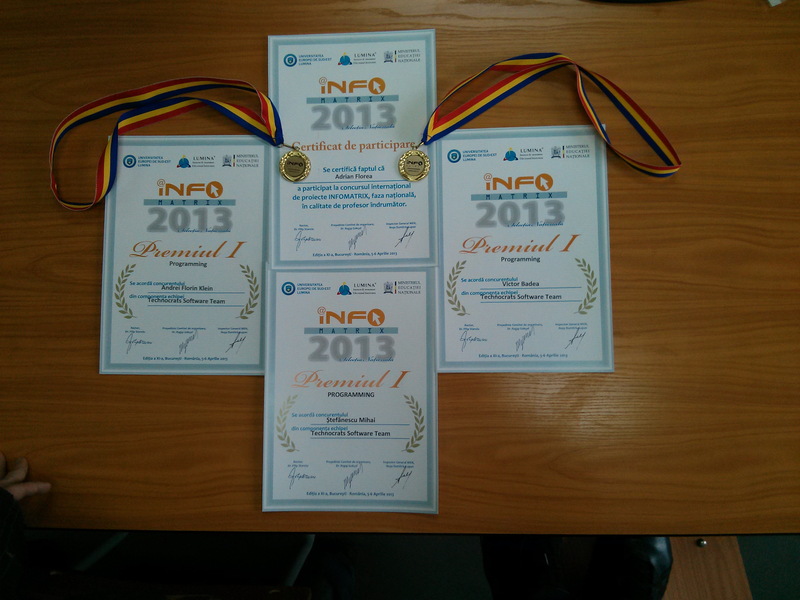 At national selection contest of InfoMatrix 2013, the project won the gold medal finishing in first place in the 51 romanian projects participating in the Programming section. 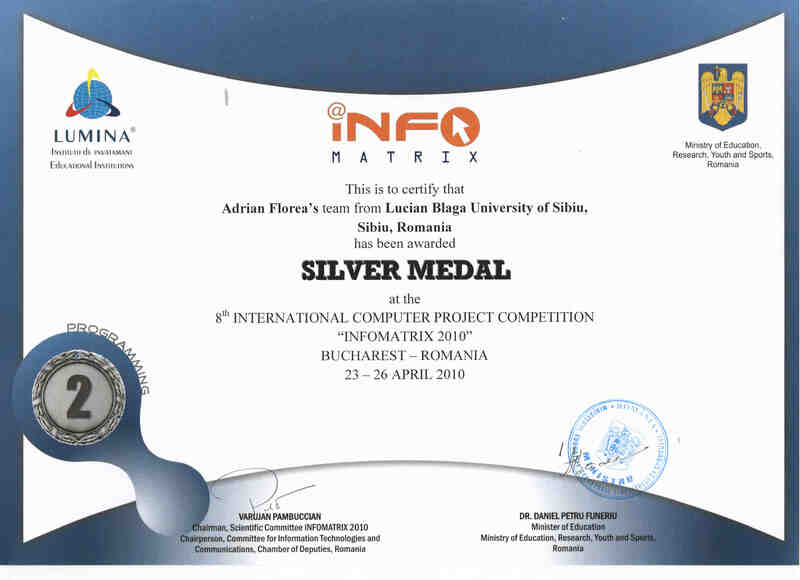 Gold Medal, (as coordinator of the Tech-Spirits II (ULBS) team) got at the Hardware Control section, the National Phase of the 13th International Informatics Project Competition “INFOMATRIX 2015”, 27 of March 2015, Bucharest, Romania, organized by the Ministry of Education of Romania, the Group of Education Institutions “Lumina” and The School Inspectorate of Bucharest. Best Paper Award received for the article "Low Cost Mobile Embedded System for Air Quality Monitoring", presented during SMART 2017, The Sixth International Conference on Smart Cities, Systems, Devices and Technologies, held in Venice, Italy during June 25 - 29, 2017. 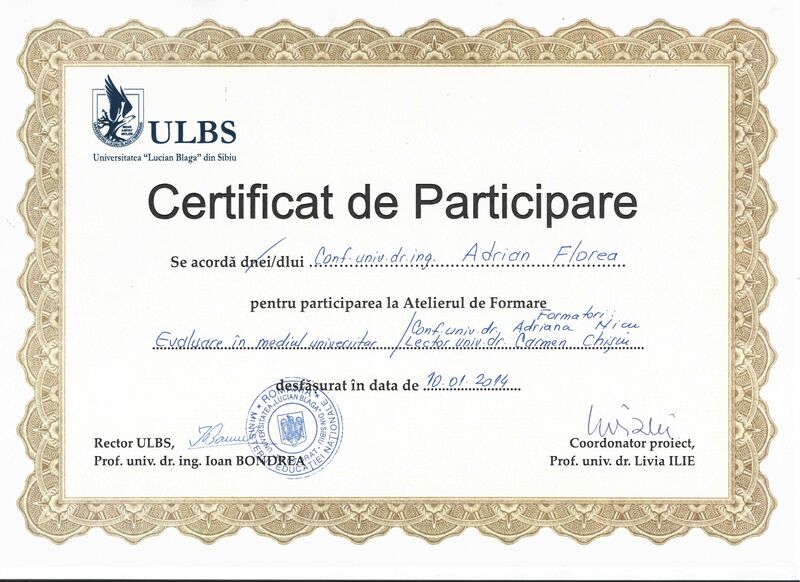 The prize "The team with the best experiment" was received at the contest "Sibiu of researchers: science, technology and culture", 2017, organized at the "Night of Researchers" event, awarded by the research department of Lucian Blaga University in Sibiu. Member of the International Program Committee for the International Conferences: * International Conference on the Business and Digital Enterprises (ICBDE 2010), Gopalan Educational Society, Bangalore, India; * The 2010 International Conference on Informatics, Cybernetics, and Computer Applications (ICICCA 2010), Bangalore, India; * The Second International Conference on Networked Digital Technologies (NDT 2010), Praga, Cehia; * The Third International Conference on the Applications of Digital Information and Web Technologies (ICADIWT 2010), Fatih University, Buyukcekmece, Istanbul, Turkey; * The 9-th International Conference Romanian Educational Network (RoEduNet2010), Sibiu, Romania; * The International Conference on Digital Information and Communication Technology and its Applications, Dijon, France 2011; * The 2nd International Conference on Software Engineering and Computer Systems, Pahang, Malaysia, 2011; * The 9th Annual Industrial Simulation Conference, 2011, Venice, Italy; * The 6th International Conference on Digital Information Management, 2011, Melbourne, Australia; * The 10th Annual Industrial Simulation Conference, 2012, Brno, Czech Republic; * The Fifth International Conference on the Applications of Digital Information and Web Technologies (ICADIWT 2012), Nicosia, Cypru; * The Fourth International Conference on Networked Digital Technologies (NDT 2012), Canadian University of Dubai, Dubai, United Emirates of Arabia; * The 7th International Conference on Digital Information Management (ICDIM), 2012, University of Macau, Macau; * The 2013 World Conference on Information Systems and Technologies (WorldCIST), 2013, Algarve, Portugal; * The 8th International Conference on Digital Information Management (ICDIM), 2013, Islamabad, Pakistan; * The 1st International Conference SIMEX'2013, September 2013, Brussels, Belgium;* The 2014 World Conference on Information Systems and Technologies (WorldCIST), 2014, Madeira, Portugal; * The 17th International Conference on Business Information Systems (BIS), 2014, Larnaca, Cyprus; * The Fifth International Conference on the Applications of Digital Information and Web Technologies (ICADIWT), 2014, Bengaluru, India; * The Fourth International Students Conference on Computer Science: Imagination, Creativity, Design, Development(ICDD), 2014, Sibiu, Romania; * The 2nd International Conference on Computer Applications in Education (ICCAE), 2014, Indianapolis, Indiana, USA; * The 2nd International Conference SIMEX'2014, December 2014, Brussels, Belgium; * The 9th International Conference on Digital Information Management (ICDIM), September, 2014, Phitsanulok, Thailand; * The 2015 World Conference on Information Systems and Technologies (WorldCIST), 2015, Ponta Delgada, São Miguel, Azores, Portugal; * The 18th International Conference on Business Information Systems (BIS), 2015, Poznań, Poland; * The 17th IEEE Conference on Business Informatics (CBI), 2015, Lisbon, Portugal; * International Conference on the Applications of Digital Information and Web Technologies (ICADIWT), 2015, Macau, Hong Kong; * The Fifth International Students Conference on Computer Science: Imagination, Creativity, Design, Development(ICDD), 2015, Sibiu, Romania; The 14-th International Conference Romanian Educational Network (RoEduNet2015), Craiova, Romania; * Reviewer for ICSTCC 2015 (19th International Conference on System Theory, Control and Computing), Cheile Grădiştei, Romania; * The 1st International Conference on Big Data Applications and Services (BigDAS), Jeju Island, Korea, 2015; * The 3rd International Conference SIMEX'2016, February 2016, Brussels, Belgium; * The 2016 World Conference on Information Systems and Technologies (WorldCIST), March 2016, Recife, Brazil; * The Seventh International Conference on the Applications of Digital Information and Web Technologies (ICADIWT 2016); * The 19th International Conference on Business Information Systems (BIS), 2016, Leipzig, Germany; * The 2017 World Conference on Information Systems and Technologies (WorldCIST), April 2017, Porto Santo Island, Madeira, Portugal; * The 20th International Conference on Business Information Systems (BIS), 2017, Poznań, Poland; * The Seventh International Students Conference on Computer Science: Imagination, Creativity, Design, Development (ICDD), 2017, Sibiu, Romania; * The Sixth International Conference on Smart Cities, Systems, Devices and Technologies (SMART) 2017, Venice, Italy; *The 2017 International Conference on Advanced Technologies Enhancing Education (ICAT2E), 2017, Qingdao, China; * The Sixth International Conference on Future Generation Communication Technologies (FGCT), 2017, Dublin, Ireland; * The 5th „Smart Cities” Conference, 2017, Bucharest, Romania; * The Ninth International Conference on Advances in System Simulation (SIMUL), 2017, Athens, Greece; * The Twelfth International Conference on Digital Information Management (ICDIM), September 12-14, 2017 at Fukuoka, Japan; * First International Workshop on Entrepreneurship in Electronic and Mobile Business (IWEMB) 8-9 November, 2017, Bangkok Thailand. Co-chair at International Conference “Future Generation Communication Technology (FGCT 2012)” organized by British Computer Society and supported by IEEE UK & RI, Londra 12-14 Decembrie 2012, UK; * Program Chair at The 9th International Conference on Digital Information Management (ICDIM), 2014, SIAM University, Bangkok, Thailand. Scientific Reviewer Journal of Circuits, Systems and Computers (a World Scientific Scientific Publishing Company journal), 2008. Scientific Reviewer for Applied Soft Computing Journal since November 2016..
Scientific Reviewer for international conference The Thirteenth IEEE Asia-Pacific Computer Systems Architecture Conference (ACSAC 2008), Taiwan 2008 (http://www.ccrc.nthu.edu.tw/acsac2008/OrganizingCommittee.htm). Scientific Reviewer for – The 3rd International Symposium on Intelligent Distributed Computing (IDC 2009), Cyprus, 2009. Scientific Reviewer for – The IEEE International Conference on Intelligent Computer Communication and Processing (ICCP09), Cluj-Napoca, Romania, 2009. Scientific Reviewer for – The International Conference on Engineering and Meta-Engineering: ICEME 2010, ICEME2011, Orlando, Florida, 2011. Scientific Reviewer for – The International Conference on Architecture of Computing Systems (ARCS 2010), Hannover, Germany, 2010. Scientific Reviewer for - The International Conference – The 14th World Multi-Conference on Systemics, Cybernetics and Informatics: WMSCI 2010 and The 16th International Conference on Information Systems Analysis and Synthesis: ISAS 2010, the last two organized in Orlando, Florida, 2010. Scientific Reviewer for book entitled "Analysis and design of algorithms. A pragmatic approach by Java applications" (in Romanian, author - Arpad Gellert), TechnoMedia Publishing Hall, 2010. Scientific Reviewer, Review Board member and Associate Editor for Journal of Digital Information Management (ISSN 0972-7272), 2010-2017 (http://www.dirf.org/jdim/editor.htm). 2017-2018 - Editor in chief for the Journal of E-Technology, Print ISSN: 0976-3503. January 2015 - Scientific Reviewer for for the IEEE Transactions on Education journal (ISSN 0018-9359) (see reference, pg. 76). September 2018 - Scientific Reviewer for for the IEEE Access journal (ISSN 2169-3536). November 2015 - March 2016 - Scientific Reviewer for the Vehicle System Dynamics journal (ISSN 0042-3114). Scientific Reviewer and Editorial Board member for Journal of Data Processing (http://www.dline.info/jdp/eb.php ), 2011. There are more than 100 (up to 2019) scientifically papers or books that make citations . We are considered among the researchers which have found that Jikes RVM provides a useful vehicle for research on the frontiers of virtual machine technologies. Our paper "The Impact of Java Applications at Microarchitectural Level from Branch Prediction Perspective" having as authors Adrian Florea, Arpad Gellert, Lucian Vintan, Marius Veltan and appeared in International Journal of Computers, Communications & Control, ISSN 1841-9836, E-ISSN 1841-9844 Vol. IV (2009), No. 1, pp. 27-40 - was included in the list of all publications that use Jikes RVM. This list includes both papers written by Jikes RVM developers, as well as users http://jikesrvm.org/Publications). 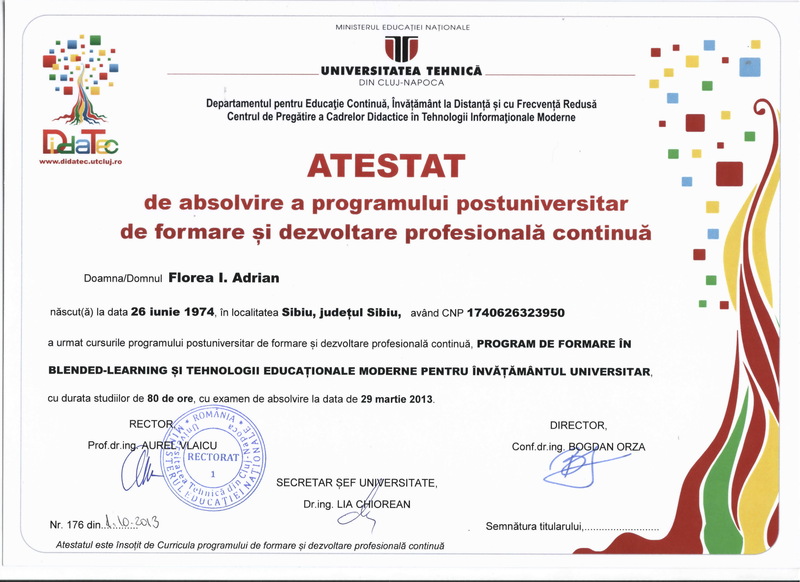 Short Time Expert in DOCIS (2008-2011) project development team - "The Development of the National Qualifications Framework for Higher Education in Romania", for describing the qualifications of license program: Multimedia Systems. DOCIS Project is financed by Social European Fund and Romanian Guvern (POS DRU) based on POSDRU/2/1.2/S/2 contract http://docis.acpart.ro/uploads/Fisiere/anunt_experti_TS_admins.pdf). Coordinator Teacher, REF – 2010/TIS/T10/FLOREA, in EUROPEAN SCHOOLNET Project, in order to coordinate peer team for creation of a module of four teaching units of two hours developing a theme linked to INTERNET SAFETY (Theme assigned: T10 - Social Networking - use by teachers (points to watch e.g. privacy, photos...)). Elected member in Faculty Council of Engineering Faculty, 2012-2016. Member in Organisation Committee and Chairman at International Symposium "TRADITION AND INNOVATION IN MODERN SCHOOL", for sections "Extra-school activities - examples of good practices related by traditions and customs and their educative values" and "Traditional family versus modern family - educational partner", symposium organized by "Queen Mary" School from Sibiu having partners "Lucian Blaga" University of Sibiu, The District School Inspectorate of Sibiu and Schools from Romania, Italy, Ireland and Spain, Sibiu, 20 november 2009. 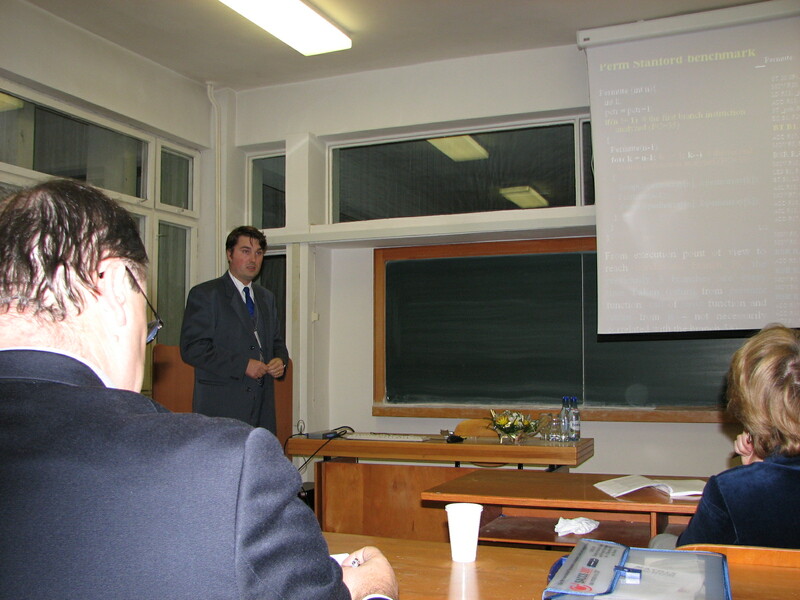 Member in Technical Committee and Chairman at 9-th International Conference “Romanian Educational Network” (RoEduNet2010), Section 4: Data Mining and Semantic Web – DMSW, „Lucian Blaga” University of Sibiu, Romania, 24th – 26th June, 2010. Chairman at 18-th International Conference on "System Theory, Control and Computing” (ICSTCC 2014), Regular Session FrA24: Hardware Design, Sinaia, România, 17-19 October, 2014. Member of jury for evaluating the scientifically papers presented by young researchers from most important universities of Romania within “Student Paper Contest” organized in conjunction with RoEduNet 2010 Conference (http://roedu2010.ulbsibiu.ro/paper_contest/ ). 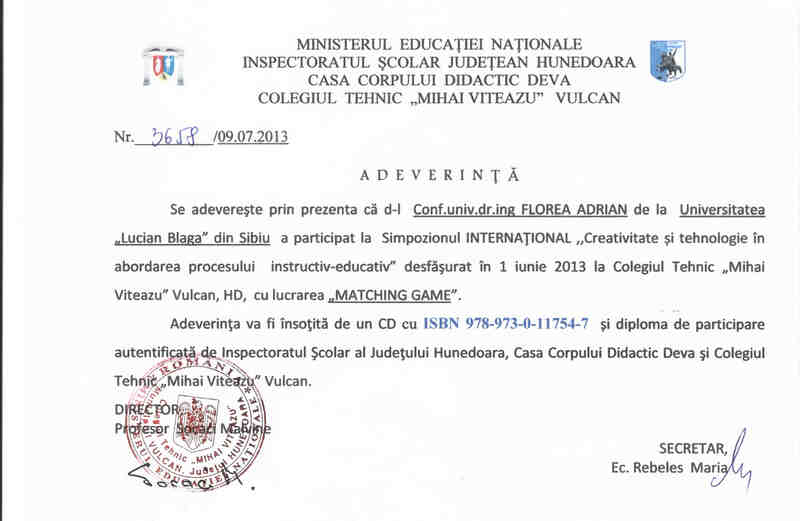 Expert Evaluator of "The Romanian Agency for Quality Assurance in Higher Education" (ARACIS) - see http://pfe.aracis.ro/inscriere/registru/lista_c_d/13/43/. I passed the specific exam in 2010. External expert evaluator of National Qualifications Authority (http://www.anc.gov.ro ), since 2011. National Committee Member of the validation master qualification / skills in the areas of Systems Engineering (SE) and Computer and Information Technology (CTI). Expert reviewer of the Executive Agency for Higher Education, Research, Development and Innovation Funding (UEFISCDI) for PN-II-PT-PCCA-2013-4 program (2013-2014). 1.04.2014 – 1 October 2015: Long Time Expert for activities with Target Group - "Lucian Blaga" University of Sibiu – in FormING project – „Insertie activa pe piata muncii prin FORmare profesionala inovativa in domeniul INGineriei”, Partener 3 – ULBSIBIU, contract POSDRU /125/5.1/S/134003, strategic project funded by Fondul Social European and Romanian Guvern through Operational Program Developing Human Resource POS DRU 2007 – 2013. 27.03.2017-26.03.2020: Researcher in iREAD - Infrastructure and integrated tools for personalized learning of reading skill, Proposal number: 731724, H2020-ICT-2016-2017, Topic Topic ICT-22-2016, 2016-2017, Buget ULBS 192725 Euro (ULBS - Mihu P. Ioan project manager). Advanced Computer Architecture, numerical processing algorithms, Prediction and Speculation in Advanced Architectures, Embedded Systems, Microprocessors and Microsystems, Multicore architecture, New computing paradigms, Visual and object-oriented programming techniques, Compilers, Software scheduling, Simulation instruments and Benchmarking, Linux programming, Evolutionary Computing, Genetics Algorithms, Multi-objective Optimization Problems, Educational software, Parallel programming models, Automatic Parallelization models, Automatic learning and fault tolerant systems, History of Computer Science.